Less than an hour outside of the bustle and hustle of Havana, escape to Las Terrazas, a UNESCO Biosphere Reserve. Once hectares of deforested farmland, Castro ordered the planting of millions of plants and trees. Travel through bamboo groves, past teak and royal palms. See birds and flowers and waterfalls of the Rio San Juan, a clear mountain stream. Live amongst the locals in this “casa particular”, Cuba’s equivalent of a bed & breakfast homestay. Learn about the lifestyle, culture and real-life realities of our hosts. More intimate than a hotel, experience a slice of Cuban life as it’s actually lived. Take a day trip to beautiful Cayo Jutias, 3km of white sand on Cuba's coastline. It is a perfect spot for snorkelling or just blissing out on the beach. Channel your inner Gilligan and strand yourself on this cay off the north-west coast of Cuba’s Pinar del Rio province. Other than local restaurants with delicious seafood, a bunch of palm trees and a mangrove, there isn’t much here except a gorgeous white sand beach accented by aquamarine waters—but what else could you need? Bliss out. Snorkel. Swim. Enjoy! Slather on the sunscreen and head out into the tantalizing waters. Float effortlessly in the clear warm water and look for schools of fish, coral, sponges and more. Spot a sea turtle in the sea grass. On your way to Trinidad, visit a "vega" or cigar factory, to see how the famous Cuban cigars are made. Enjoy an orientation walk of Trinidad's beautiful centre after settling into the homestay. Tobacco season starts in November and ends at the beginning of April. Live amongst the locals in this “casa particular”, Cuba’s equivalent of a bed & breakfast homestay. Learn about the lifestyle, culture and real-life realities of our hosts. Enjoy an open-air meal on top of the main house one evening. More intimate than a hotel, experience a slice of Cuban life as it’s actually lived. Pinar del Rio is tobacco country. Fans of the ubiquitous Cuban cigar will be hard-pressed not to be impressed by this tour. See fields of green plants punctuated by thatch roof drying huts, then witness a demonstration of how the cured leaves are hand-rolled, cut and packaged. Prepare for the smell. The smell of tobacco is heady and headache-inducing. Buy a box to bring home to friends. Or smoke them all by yourself. Explore this beautiful colonial town and its surrounding beach and attractions. Loosen up those hips and get ready to salsa. Classes are led by expert Cuban instructors and you even get your own practice partner. Rumba, mambo and cha-cha-chá your way across the floor. Never danced salsa? Have no fear, Cubans are happy to share the secrets behind one of their national pastimes. For nearly four decades, the Casa de la Trova has been the centre of culture and nightlife in Trinidad. This bar/performance space is home to some of Cuba’s finest singers and musicians. These former “trovadores” (troubadours) once walked the streets in twos and threes, performing ballads (boleros). Now – people come to them to listen, dance and soak in the laid-back rhythms of this made-in-Cuba music. Rent a mask and snorkel and head out into the warm blue-green waters off the Ancón Peninsula. Centuries of ocean currents have created beautiful beaches, a perfect backdrop to see coral, fish and shells. Explore the reef just offshore from Playa Ancón and be sure to wear lots of sunscreen! Rent a bike, pack some water, put on a hat and head south of Trinidad toward the beaches. La Boca is a small seaside village at the mouth (“boca”) of a river about 5km (3 mi) from town. Keep going and end up at Playa Ancón. Avid cyclers can head towards Sugar Mills Valley 18kms (11 mi) away to explore the historical site, but just a heads-up, the route is very hilly. The waters around Cuba are known for their gentle tides, warmth and diversity of underwater flora and fauna. Grab a mask and tank, pull on some flippers and head down into the depths to discover all this for yourself. Off the Ancón Penninsula, find a narrow shelf with a sandy bottom, home to marine sponges, black coral and schools of colourful tropical fish. Stop by Santa Clara en route to Trinidad and visit important historical sites, including the famous Ché monument. 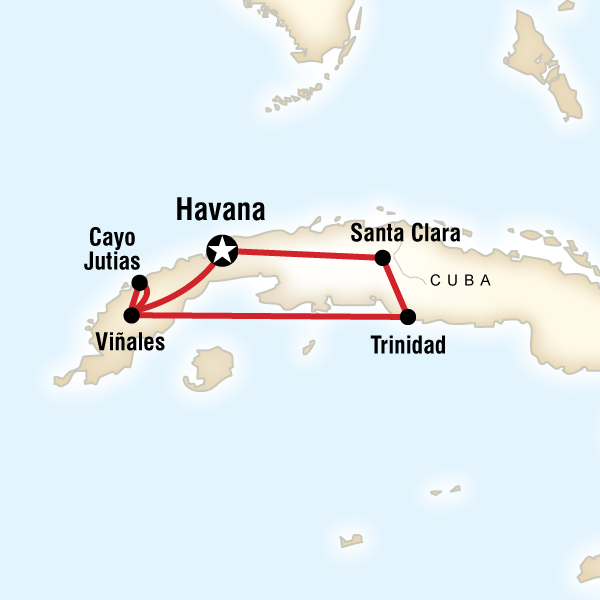 Santa Clara played a key role in the Cuban Revolution. In 1958, rebels led by Ernesto (Ché) Guevara captured an army garrison and they bulldozed and derailed a train full of troops and supplies bound for Havana. Visit the monument and site (referred to as “Tren Blindado”), as well as the Museo Histórico de la Revolución, which chronicles the Battle of Santa Clara and honours the revolutionary hero with a large bronze statue. Take a walking tour of Havana and find out what your CEO loves best about this amazing city. See city highlights that may include La Catedral de San Cristóbal de La Habana, the Palacio de los Marqueses de Aguas Claras (which now houses a restaurant), the Museo de Arte Colonial and the Plaza de Armas, with its statue of Manuel de Céspedes (one of the leaders of the Cuban independence movement). Use this walk as a jumping off point to explore the rest of this lively city.